Our friends from the ICIJ (International Consortium of Investigative Journalists) just announced the Paradise Papers this past week, a new trove of leaked documents from the law firm Appleby and trust company Asiaciti. Similar to the Panama Papers before (which we covered in-depth here), we’ve learned from those records that a large number of people and organizations use shell companies in tax havens and offshore jurisdictions to hide, move and spend huge amounts of money (billions to trillions of USD) without the necessary fiscal oversight. In the last few days we saw a huge number of reports being published covering activities of companies like Nike, Apple, unsavory involvement by the Queen’s investment group, connections of Russian investments to politicians like Wilbur Ross or companies like Facebook and Twitter and many more. 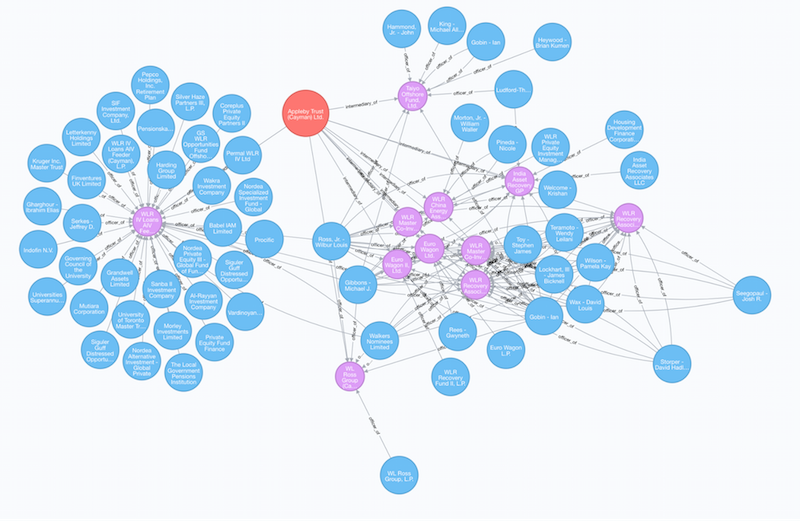 The more than 13 million documents, emails and database records have been analysed using text analysis, full-text- and faceted-search and – most interesting to us – graph visualization and search. Special thanks go to the the Pulitzer Center on Crisis Reporting for supporting visual elements of the project, Neo4j and Linkurious for database support. We are especially proud that Manuel Villa, whose position was sponsored by our “Connected Data Fellowship” was able to contribute to the research and data work. As before, the leaked information was added to the already large body of data from previous leaks in a comprehensive Neo4j database that was available both to the data team as well as the investigative journalists. The ICIJ published a fraction of the Paradise Papers data as part of their Power Players visualization at the same time as the reported stories. 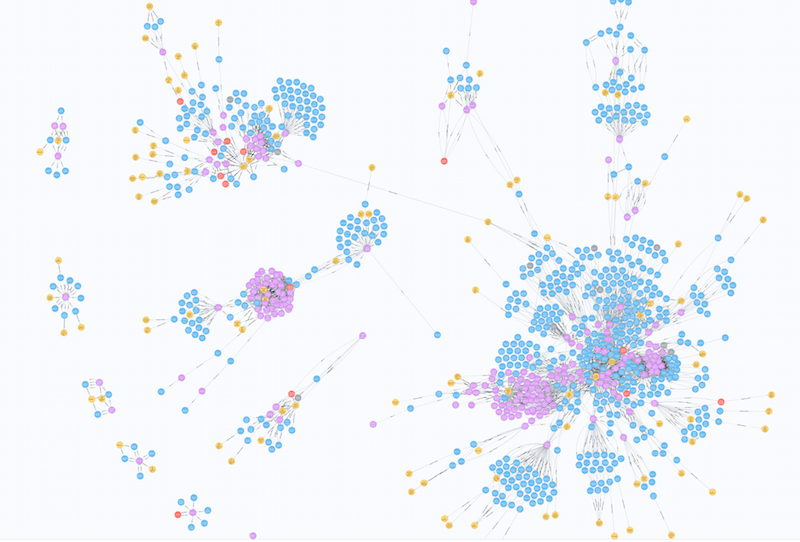 There are about 1000 nodes and 3000 relationships in this preliminary dataset. We’re expecting the ICIJ to release larger parts of the dataset soon, and we will keep you updated with further findings. Law-firms or middlemen (Intermediary) that asks an offshore service provider to create an offshore firm for a client. Each of these carries different properties, including name, address, country, status, start and end date, validity information and more. Relationships between the elements capture the roles people or other companies play in the offshore entities (often shell companies), we see many officer_of relationships for directors, shareholders, beneficiaries, etc. Other relationships capture similar addresses or the responsibility of creating a shell company by a law firm (intermediary_of). Until the data is officially published we used the information from the ICIJ’s website for some examples on the reported stories. 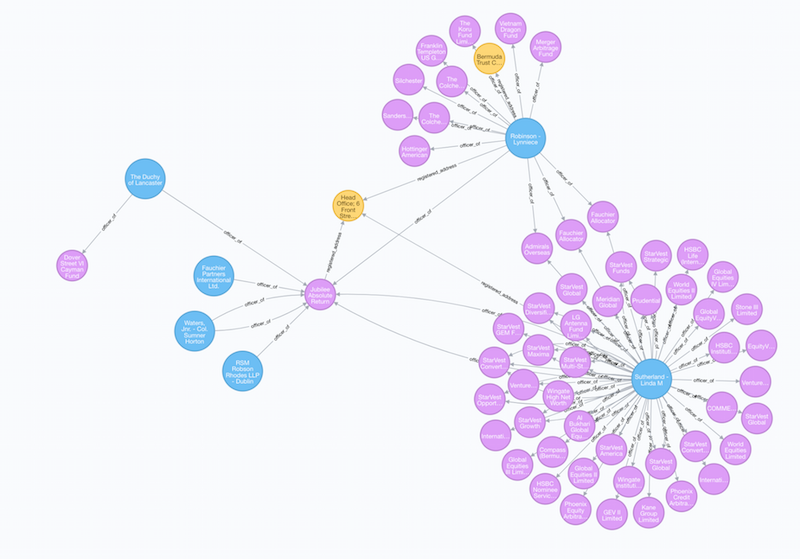 This initial Neo4j graph database consists of information about 212 legal entities, 669 officers connected to those entities, which were established through 15 different intermediaries (often law firms used to incorporate the legal entities). 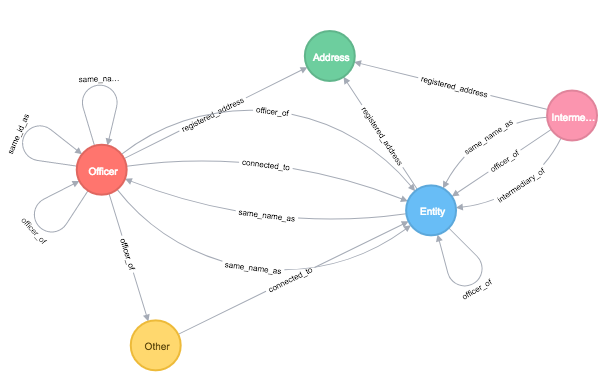 We can now use the data in Neo4j for interactive graph visualization, but also for full graph querying and later for the application graph algorithms (Part 2 of this blog series). The distribution of degrees for our entities shows a typical power law: there are some addresses which have 127 companies registered and some people who have almost 90 shell companies registered to their name. Remember, this is a tiny fraction of the Paradise Papers data. These are our relationships, so you see it’s mostly officers and addresses for entities and officers. What is interesting here, is the number of “appleby assigned attorneys” and “ultimate beneficial owner” which are not visible in the fiscal records. One important question we can ask is: What are the most popular offshore jurisdictions used by people in other countries? We can see that the most common jurisdictions of entities with connections to people with addresses in the U.S. are Bermuda and the Cayman Islands, which also confirms common knowledge and the reason why so few Americans were in the Panama Papers, since Panama is not a common offshore jurisdiction for Americans. Of course keep in mind that this is only querying a subset of the data. In our next blog post we’ll look at analyzing the full dataset. The current U.S. Secretary of Commerce, Wilbur Ross, was revealed to have connections to offshore companies, as reported by the ICIJ earlier last week. // What are the jurisdictions of Ross's connected entities? 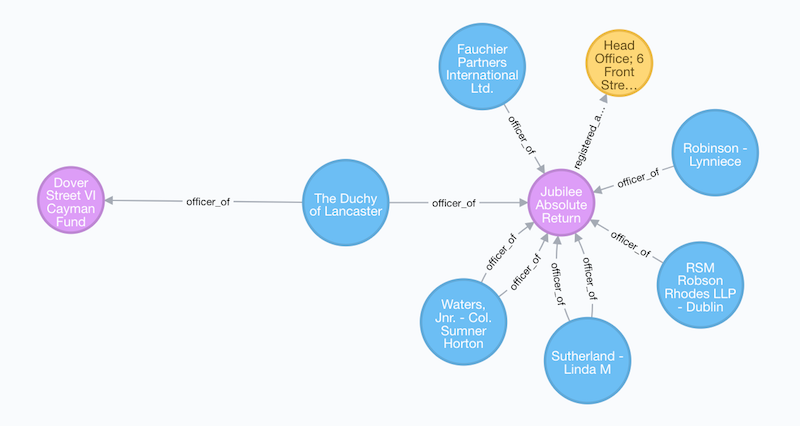 The Duchy of Lancaster – Queen Elizabeth II’s private estate and portfolio – appears in the Paradise Papers dataset. An investment of several million dollars was made in a Cayman entity, Dover Street VI Cayman Fund by the Duchy. While the Queen’s estate regularly reports some domestic investments and holdings, offshore holdings, including the Dover Street VI Cayman Fund investment had not been previously reported. These individuals serve as corporate services managers, where they may serve as officers for hundreds of offshore entities. This post was an introduction to the Paradise Papers dataset, with some examples from the recently published investigations. In our next post, we will explore how we can apply graph algorithms, virtual graph projections, more advanced querying and spatial analysis to the entire Paradise Papers dataset. 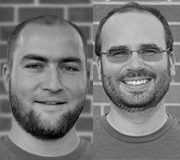 Want to learn more about what you can do with graph database technology? Click below to get your free copy of the O’Reilly Graph Databases book and discover how to harness the power of connected data. William Lyon is a Developer Relations Engineer at Neo Technology. Prior to joining Neo, William worked as software developer for several startups in the real estate, quantitative finance and predictive API spaces. William holds a Masters degree in Computer Science from the University of Montana. I don’t know how you guys do this, but thank you. And thanks to the person(s) who leaked the data.